Common Eider Duck, originally uploaded by Dave Walsh Photography. 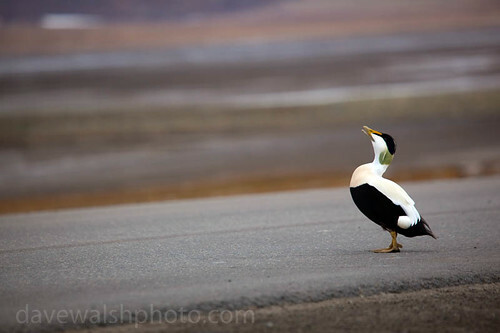 Eider drake stands on a roadway outside Longyearbyen, while craning its neck to vocalise its oh-oooo call. Common Eider Duck, Somateria mollissima, at the dog yard outside Longyearbyen, on the Arctic island of Spitsbergen, Svalbard. The eider nest between two enclosures of sled dogs on the outskirts of Longyearbyen, where the eggs are safe from the arctic fox, which is too scared to come close to the howling dogs.